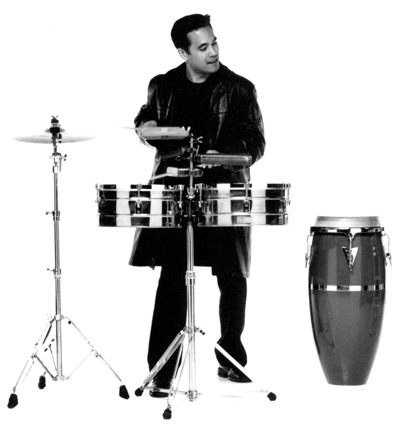 Musical past and present in one rambling run-on sentence: My father was musician and loved Latin music, so as a kid, I grew up listening to: Tito Puente, Fania All Stars, Eddie Palmieri, Batacumbelle and Poncho Sanchez. – And I really hated it! I liked Rock music: Rush, The Jimi Hendrix Experience, The Rolling Stones and the Who. So, as a teen my father introduced me to Santana and I was able to see the relation between Latin and Rock music. So I started to slowly appreciate Latin music. Within a few years, I fell in love with Latin music and now playing latin jazz and afro cuban music in my band Rumba Calzada is what I do for a living. So, my early years of having to listen to Latin music has proven to be the best education a father could give a son. My favorite bands and musicians include: Tito Puente, Batacumbelle, Eddie Palmieri, Celia Cruz, Fania All Stars and Poncho Sanchez. Although, I am a fan of Mozart and Beethoven and I do enjoy Rock, Jazz, and Bluegrass music. Mi bajo con tumbao rico y sabrociao. A sunny day….. light breeze…..running…… playing music ………. going for swim……..eating ……… having a beer………..There are too many perfect days to describe! Being lucky that I get to play music for a living. In my bed…….. sleeping well. See places in the world that I would like to see, like Paris, France and the pyramids in Egypt. Still playing music, running, travelling, eating well, spending time with family, friends and the people I want to be around.